What I find really interesting is that based on Mike's information about this casting (splendid job btw, thanks for all the information) the ROTJ style Vader helmet existed already in 1978! Yeah, that's pretty interesting to me too, but maybe they kept experimenting with the look before settling on the ESB look we know, sorta like doing new concepts. We know they did that with the trooper armor, since there is at least one with very RotJ-like looks to them. The original news article stated Alan Croucher kept two helmet "moulds" (probably meaning casts) after production. One being the one here and another going to a friend in the U.K. .... so is this other helmet accounted for? By the way great research and pictures Mike. Best thing would be to ask Alan Croucher directly. I have been doing a bit of research myself and I can confirm the other helmet is indeed in the UK and NOT owned by Brian Muir. The other helmet is still with the guy it was sent to in the late 70's. As he recalls he had it sent to him in either 77,78,79 at the latest which ties in well with the other helmet.
" I worked on Star Wars A NEW HOPE in the plaster rooms EMI studios Elstree. 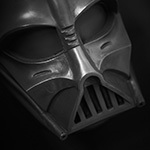 I was asked to make a mould from a clay sculpt of Darth Vader. I cast about 6 helmets two of which I managed to get hold of. The others went off to be spayed. One of these helmets was sent to a family friend in australia whilst the other went to a friend in the UK for his son. The original owners father in Australia passed away and it was now passed on to Dennis ****** who has had it since about 2015. I have many pics of the UK helmet and it does look to me to be the same as the australian helmet. the Dome is identical. There are no holes drilled in it suggesting they were drilled after it was received. I am trying to get in touch with Alan as he only lives about 2 miles from me but as yet he has not responded. I can also confirm that Alan is a plaster and has worked on many films as head of dept for saving private Ryan, Barron Munchausen, Alien 3, Notting Hill, Band of Brothers, Lost in Space etc. So is Alan Croucher the man who made the original mould of the DV helmet from the Brian Muir original clay sculpt? Thanks fo the info on the second Croucher helmet. So it looks like fact that the ROTJ style Vader dome existed pre-1980. I think Croucher is mixing things up in his COA for the down under helmet. My guess is that he molded the plaster cast of the ROTJ style Vader dome. But there is a possibility that he molded Muirs original ANH plaster cast, too. Someone should confront the man with the plaster casting in Grunbergs collection, maybe he remembers seeing it at one point. That is phenomenal. Thanks for the all the work Mick. That faceplate casting looks so crude in such a wonderful and charming kinda way - like someone snuck into the studio, and pulled a quick cast before anyone knew about it. Love that you can still see the modeling cut marks around the mouth. Hey fellas- thanks for all the thanks. Great to be able to be involved in a new find. Toms put it well here. I expect Alan is mixing up movies or he's he's merging facts with a little summation which to him probably is no big deal. Fantastic work, thanks very much for your efforts Mick, it's really great to see this. ..and thanks to you Mark for the background work you've done as well. Vader casts everywhere at the moment it seems! It just shows how many private casts were made over the years! Thanks Mickxc for making the trip, the excellent pics, and your evaluation. But this is very much an authentic casting. You wrote in your evaluation: "Some shrinkage or slight warping on the RHS check in combination with the RHS tusks being pushed in at the back. Only identified when measuring it & comparing it to the TM." 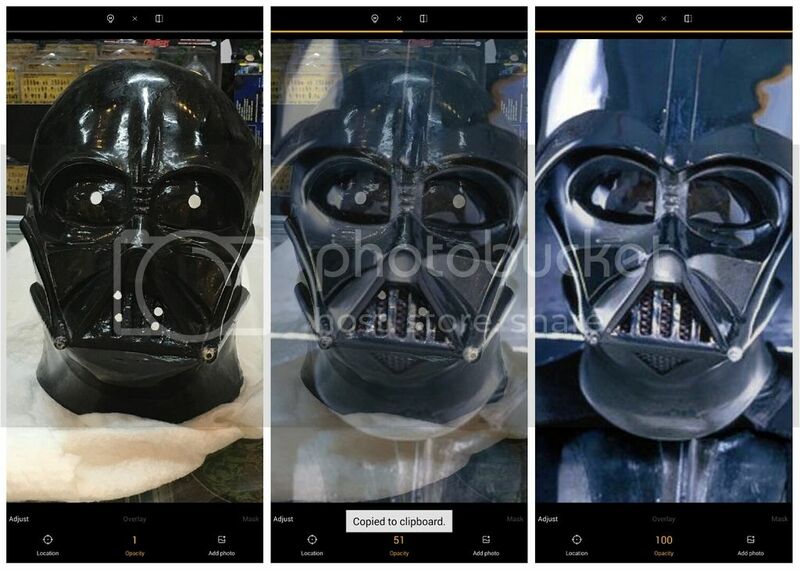 This reminds me of a similar trait in the ESB promo poster Vader mask, and when the photographs are overlaid, the shapes are very similar; though this mask doesn't have the base of the right side of the neck pulled in as seen in the promo mask. If you can post the overlay comparison it would be great to see.